As the leaves begin to fall to the ground, we begin to desire hearty soups and stews that warm us from the inside out. Chicken soup and bone broth are beneficial when we are feeling under the weather, but sometimes it takes a healthy dose of vegetables to set us straight on our way. It is a feeling that cannot be described, sometimes there is just a momentary meal or two to set meat protein aside and indulge in all the green you can fill your belly with. And broccoli is good for you! Even if you are a picky eater, it is impossible to avoid it forever, for it is in so many recipes, and many times it is a main ingredient. For example, life is not complete without eating broccoli with wild mushrooms or oven roasted broccoli with almonds. Cruciferous vegetables have both nutritional and medicinal benefits: they help us boost our immune system, they decrease inflammation, they improve our digestion and aid the absorption of nutrients. They also help our skin shine with a healthy glow and allow our eyes to stay strong, which is especially important if we spend too much eye-straining time on technology all day. 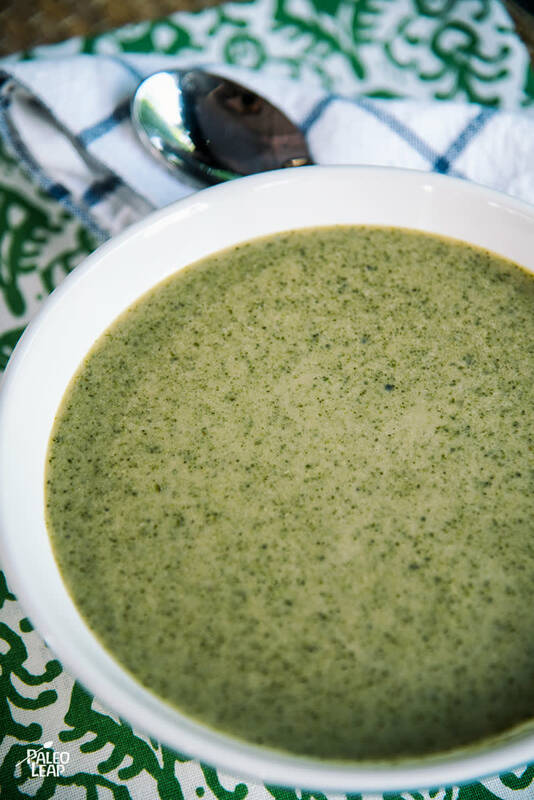 This Paleo broccoli soup stands alone as a cordial meal and if you have leftovers, you can even take it to work. If you have half a portion left, do not throw it away, you could always use it as a sauce over chicken breasts, for when you are ready for that protein burst again. Melt ghee over medium-high heat in a saucepan. Add onion and garlic to the saucepan and cook 3 to 5 minutes. Add the broccoli florets and cook another 3 to 5 minutes, stirring occasionally. Sprinkle the cumin, thyme, nutmeg, and season to taste. Add vegetable stock, mix everything well and bring to a simmer. Lower heat to medium and cook 30 to 35 minutes. Pulse the broccoli with an immersion blender until smooth. Pour in the coconut milk, and give another pulse until well mixed. Adjust seasoning and heat another 3 to 5 minutes.